The five Disarm Now Plowshares activists who infiltrated Kitsap-Bangor Naval Base in Washington to symbolically disarm the nuclear weapons stored there received sentences yesterday ranging from six to 15 months confinement. With the action having taken place in November 2009, this decision has been a long time coming. Over the past year we’ve covered many of the major developments, from a hilarious video produced by the Seattle Times that satirized the military’s decision to prosecute 80-year-old peace activists to the more serious trial itself. But now the judge has rendered his final ruling. Speaking as part of the Disarm Now Plowshares legal team, Anabel Dwyer and Bill Quigley laid out the broader legal picture of the case. “The problem is that nuclear weapons and the rule of law can’t exist side by side,” Dwyer said. “The other problem is, we cannot disarm nuclear weapons unless through the rule of law. We are in a conundrum here.” Quigley submitted that lawyers are obligated to “understand difference between law and justice and to narrow that gap.” He encouraged the judge to look back one hundred years and consider how many of the laws of that time were “legal but manifestly unjust.” Dwyer is a Michigan attorney and Board Member of The Lawyers’ Committee on Nuclear Policy (LCNP), and an expert in humanitarian law and nuclear weapons. Quigley is the Legal Director for the Center for Constitutional Rights in New York and Professor at Loyola New Orleans. 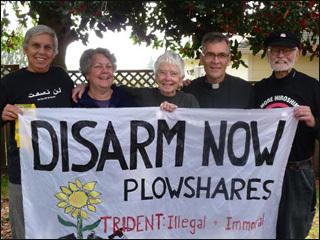 While this may be the end of the legal road for the Disarm Now Plowshares, it is only the beginning, as this last statement testifies, of the lasting impact their action will have on future generations and the anti-nuclear movement as a whole.